On my recent trip to Vancouver, BC, we found ourselves walking down Main Street in what appeared to be kind of a hip, trendy neighborhood. As evidenced by the “geek” in my business name, you may properly guess that I found myself in a hip, trendy neighborhood completely by accident–it just happened to be between two other places we had planned on going. Anyway, as we walked along, we passed a place called Shaktea on the corner of Main and 21st. What originally caught my eye was, of course, that it was a tea place. However, there are a lot of tea places that just don’t appeal to me–they’re overpriced, or only carry flavored or scented teas, or have employees who think that “oolong” is the name of a province in China. Wondering if this was one of those places, we looked at the menu and something else caught my eye: they served tea-and-cheese pairings, a topic of a previous Tea Geek class (taught by fellow tea geek Jenna May Cass at the Perennial Tea Room during the Northwest Cheese Festival). Then I noticed that they offer classes at Shaktea as well. I thought, “This might be a place worth visiting.” Unfortunately, we were on the way somewhere else. I popped in, grabbed a business card, and we were on our way. Well, the next day we stopped by again and sat down for a proper evaluation. It had a good feel–welcoming in that kind of vaguely Eastern, yoga-or-Buddhist way (rather than the less-appealing-to-me New Age spiritual bookstore way). It seemed a place where you could equally sit down and spend some quiet time with yourself, or bring in friends or business contacts for a low-key conversation over a cup of tea. The menu had some delicious things, but the daily special was personal sized white chocolate cheesecakes with raspberry so obviously that’s what we both ordered, even though I was still intrigued by the cheese and meat pairings. But what about the tea? Well, their selection was pretty good. Was it the ultimate destination for those seeking the best the world of tea has to offer? Maybe not. However, it had a good mix of flavored teas and herbal infusions for those that go for that sort of thing, as well as more exclusive selections for people like me. Again, it seemed the kind of place you could bring people of whatever level and they’d have something to enjoy. I ended up ordering their “China Keemun Superior” (which, by look and taste, is probably a Qimen Hao Ya). My partner ordered an iced Japanese Cherry (sencha and sour cherry). While deciding, I noticed that they carried a yellow tea, and had a tǒng (筒; “tube” or “cylinder”) of puer cakes on the shelf behind the counter, and other signs of approaching tea seriously and not just a lovely drink to accompany being social, or a vehicle for making money from the masses. The staff seemed reasonably knowledgeable, including one of the people who answered my question having talked about visiting countries of origin for some of their teas. As it turns out, she is one of the owners and teaches the classes there. We had a nice conversation about the trade-offs of teaching about tea and balancing basic knowledge with the more interesting, advanced stuff. All told, I think there need to be more tea places like Shaktea. It’s a cool, locally- and women-owned business. It has a little something for everyone, from those that know nothing about tea to tea geeks. They obviously care about the tea in and of itself, and go out of their way to learn more and teach what they know to those who care to listen. Was everything the perfect tea place for me? No, but that’s fine…it’s a place I feel comfortable recommending, which is a fairly rare thing. Obviously, for those who are looking for a specific kind of tea, or a specific experience, or specific knowledge, I might recommend someplace that specializes in that tea, experience, or knowledge. But I recommend Shaktea as a place to go and have a tea (and perhaps a bit of a nosh) if you’re in Vancouver, BC. Note: I apparently took no photos whatsoever when I was there, so this post isn’t illustrated. But if you go to their website, you’ll see some shots of their space in the Gallery section. This last weekend I took a little Canadian “vacation” to Vancouver, BC. I use the quotes because I spent nearly the entire weekend doing tea-related things, and in a sense that’s work as well. One of the many interesting things I saw, did, and learned was related to puer tea. One of my Canadian tea friends there has some contacts (and perhaps influence) in China with the folks who make and sell puer. He has been interested in puer for a long time, and said he likes to have a few new and interesting things for his regular customers (and tea educators like myself, apparently). This time, he had what might be called an historical recreation–a tin of puer tea made in an ancient style before tea leaves were compressed into cakes. Note: loose leaf tea the way we know it now is a more recent invention, probably only about 600 years old. Before that time, pretty much all tea was compressed into cakes, not just what we would today call puer. 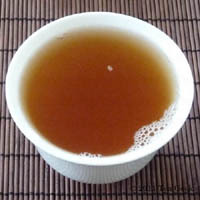 His limited availability product tries to reproduce, as well as the tea-makers knew, how tea was made in Yunnan before the widespread use of compression. This would go back to when tea was considered a medicine, not a beverage. 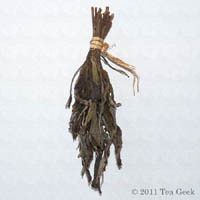 It clearly draws on how herbs are collected and dried–the leaves are tied together by their stems in little bundles that were hung up to dry. To use, just break the leaves off the stem bundle and put them in a bowl (or gaiwan, if you want a little anachronism with your tea) and add water. I did this with a bundle to see what it was like, using my matcha bowl as the most historical kind of bowl I have. 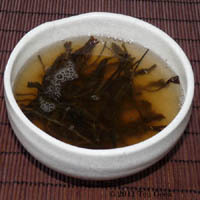 As soon as I poured the hot water on the leaves, I could smell the fragrance typical of a young sheng puer, but the liquor got pretty dark rather quickly. It was also fairly cloudy, something I wasn’t expecting. Because it smelled like a sheng but was getting a dark color pretty quickly, I poured off the infusion into a gaiwan so as not to over-steep. 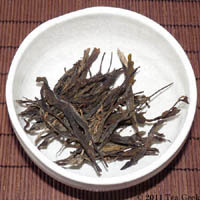 The leaves were a pretty wide range of greens, from pretty fresh-looking chartreuse to a fairly dark, almost black-tea color on some others. 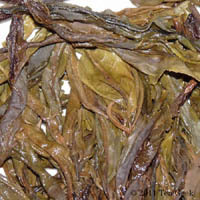 The fragrance of the leaves was something slightly different than the typical (if there is such a thing) young puer fragrance–there was something a little woodsy about it, and a touch of…a little barnyard maybe? Maybe it was the bias of knowing this was a more “primitive” style of tea, but it seemed somehow more primitive to me. It seemed simple and down-to-earth; unrefined, in its best Daoist meanings. Tasting the brew told me that I’d over-reacted in pouring off the liquor. It was fairly mild in taste, only strong in fragrance. It had just the barest hint of astringency. My tongue had the sensation of having something powdery in it, rather than the dry roughness of something really astringent, and it encouraged some saliva production. The woodsy aroma was present in the taste of the liquor, but the barnyard or whatever fragrance in the infusion didn’t translate into the taste of the liquor, though there was something that seemed kind of soapy…an experience I’ve had with other young sheng puers on occasion. Decent mouthfeel, but I bet if I’d brewed longer it would have been heavier. I haven’t tried re-steeping yet. I wanted to get this post up. If future infusions lead to something surprising, I’ll include them in the comments below. Also, Tea Geek members will have the opportunity to purchase the remaining bundles on a first-come, first-served basis as a members-only selection while supplies last.